“The Frog Lake region is Tahoe Donner’s backyard. We can get there without even leaving TD and, thanks to the generosity of Land Trust Supporters, the proposed acquisition will expand the opportunities for all the sports we love to do in Euer Valley.” – Kathy Englar, Tahoe Donner homeowner and former Development Director for the Truckee Donner Land Trust. Behind Tahoe Donner and north between Euer Valley and Independence Lake lies a Shangri-La of pristine and virtually untouched Sierra landscape. Among these preserved wilds at 7,600 feet, a subalpine lake reflects the majestic granite cliffs above. Tucked in among the old growth pine forest and steps from the clear blue lake sits an old lodge, made from hand-cut granite, built in the early twentieth century and enjoyed by the Smith family in the warm summer seasons. Felix Smith acquired Frog Lake and the surrounding square mile of mixed conifer forest from the Southern Pacific Railroad in 1930. The Smith family has been an integral part of the preservation of this landscape and it is The Truckee Donner Land Trust’s hope to continue in their conservancy. Tahoe Donner homeowners have also been a driving force in securing the preservation of this section of the Sierra Nevada. In 2017, the Truckee Donner Land Trust completed the acquisition of Lower Carpenter Valley with the help of several extremely generous donations made by TD homeowners. 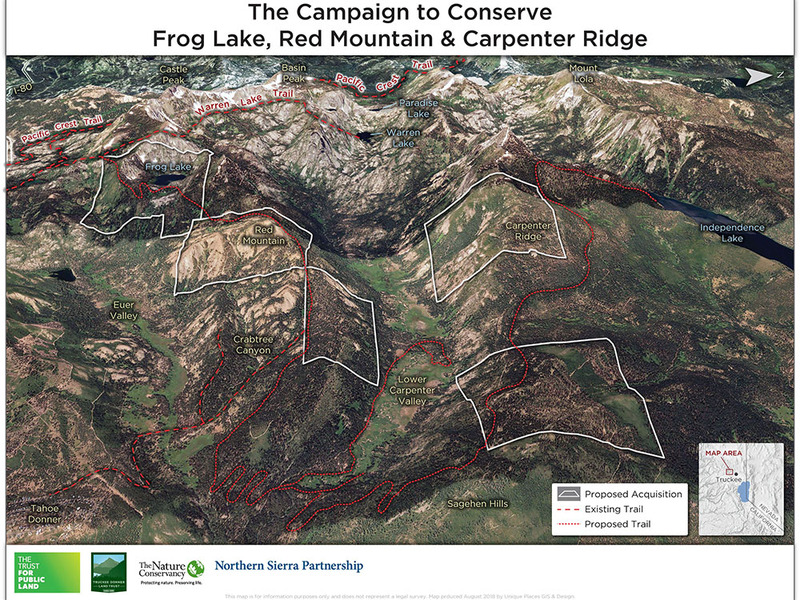 The Campaign to Conserve Frog Lake, Red Mountain and Carpenter Ridge also relies on the continued support of donors. Without the help of generous individuals, the opportunity for acquisition may be lost. If the Land Trust is able to secure the funds needed, previously inaccessible access to the lake, valley and mountain ridges will be open to Tahoe Donner members in 2020, providing new opportunity for backcountry exploration. 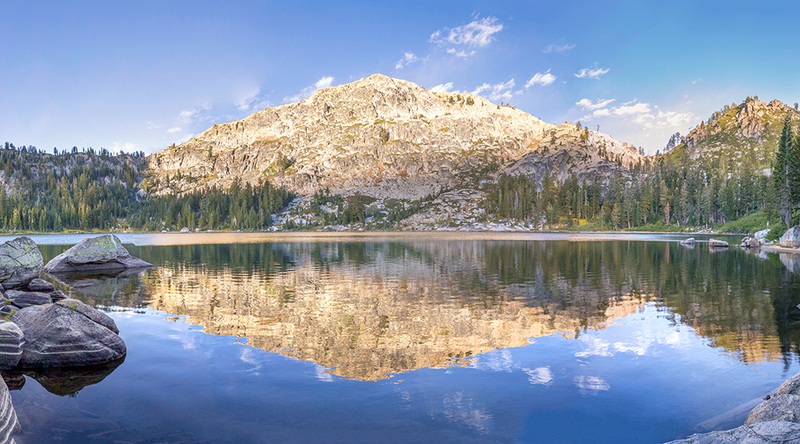 Working together as part of the Northern Sierra Partnership, the Truckee Donner Land Trust, The Trust for Public Land and The Nature Conservancy launched their plans to purchase Frog Lake, Red Mountain and Carpenter Ridge in 2020 for $15 million, including stewardship costs. The acquisition of these sections of the Sierra Checkerboard will secure preservation efforts of the landscape and keep vital corridors open for large migratory wildlife as well as open the backcountry to gentle human use and experience. The Sierra Nevada is steeped in rail history. To aid in the expansion of the Transcontinental Railroad in the 1860s, President Abraham Lincoln allocated every other square mile of the route to rail companies, while the remaining squares became National Forest. Areas of forest that were owned by the railroads became available and were purchased by private entities and logging companies, endangering the sensitive ecological balance that is so important to sustained natural development. The Land Trust’s proposed acquisition of Frog Lake, Red Mountain and Carpenter Ridge will connect the landscape between Independence Lake and Euer Valley, linking pieces of the checkerboard and opening nearly 3,000 acres of land north of Truckee. Preserving the wildlands behind Tahoe Donner is protecting its life-giving components and natural resources. It’s up to us to be stewards of this delicate habitat to ensure it will be enjoyed by our children and grandchildren and for generations to come. The watersheds in the Sierra Nevada provide more than half of the water needed for our communities. It is vital that these watersheds are protected in order to ensure access to clean water. The acquisition would conserve a variety of important natural resources, including Frog Lake, mixed conifer forests, aspen groves, creeks, mountain mahogany, wax currant, wild gooseberry, old growth trees, and a swath of wildflower varieties. Area conservation ensures that migratory corridors remain open for local wildlife like black bear, American badger, wolverine, Pacific marten, mountain lion, northern goshawk and the gray wolf, reported as visiting Nevada County in 2018. “The project creates incredible recreation opportunities which will be right in Tahoe Donner property owners' backyard. It also protects a variety of species and habitats, protect the headwaters of Prosser Creek, and create stewardship opportunities to manage forest health.” – Greyson Howard, Communications Director, Truckee Donner Land Trust. If the campaign secures the funds for purchase, the expansion of Tahoe Donner’s backyard in 2020 is extensive. Frog Lake will be accessible from Alder Creek Adventure Center via a 6.5 mile hike. You may have spied Frog Lake if you have hiked along Warren Lake trail to the Frog Lake Overlook. Proposed trail construction will include a network to connect Donner Summit, Frog Lake, Red Mountain, Crabtree Canyon, Carpenter Valley and Independence Lake, opening the wilds up to new backcountry adventures. TD homeowners will enjoy a fresh area for backcountry skiing, snowboarding and snowshoeing with access from the Tahoe Donner Cross Country Ski Center. The project includes plans to open the lodge at Frog Lake as a backcountry ski hut as well as build new huts for public use. Donate! Every dollar counts. Projects as important as this are not possible without the support of the community. Join the “Hiker Challenge to Preserve Frog Lake.” Donations of $500 or more will be matched by an extremely generous Tahoe Donner conservationist up to a total of $25,000. Visit www.tdlandtrust.org, click on “news” and scroll down to find the Hiker Challenge article to donate. Host an event and educate friends and family about this important environmental endeavor. Learn more at www.tdlandtrust.org or call (530) 582-4711. Find out how you can donate by visiting The Truckee Donner Land Trust at www.tdlandtrust.org. Read the full story including Tahoe Donner Homeowners in Action in the April 2019 issue of Tahoe Donner News.